A stunning collection of contemporary dining and occasional furniture with a unique curved finish. Treviso offers a striking range for many living room designs and entertainment rooms. A solid oak and oak veneer range with curved edges and curved legs combined with dovetailed joints offers a collection that will be the centrepiece of any room setting. With a choice of metal and wood handles included. Treviso bring a fresh, modern design that offers an abundance of character. Clean lines, luxurious with beautifully proportioned pieces, this collection offers masterful craftsmanship. Created from solid oak and oak veneer with walnut inlay, this comprehensive range of furniture will bring a touch of warmth and sophistication to any home. Accentuated design lines complement its dovetailed drawers. A 160cm dining table and a 90cm square dining table are matched with a beautifully designed solid oak chair. This range will sit pride of place in any room setting. 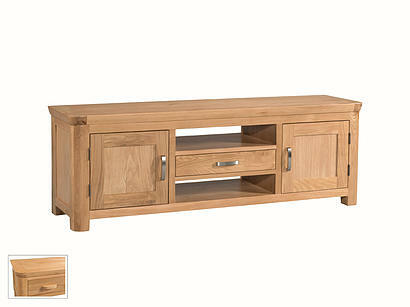 The Hannah TV Unit is made from solid oak with grey painted base and the top in natural oak finish. It features four drawers and the two central shelves.